In the mid-1960s, residents around the Great Lakes couldn’t help but notice that their beloved bodies of water were in trouble. Diminished fisheries, polluted beaches, and increasingly frequent algal blooms suggested the lakes needed saving. A nascent environmental movement, particularly around Lake Erie, forced the troubled waters into the media and onto the agendas of government agencies on both sides of the US-Canada border. Among the issues gaining attention was the disposal of dredge spoils—silt and debris removed from harbors around the lakes and, typically, dumped into open waters nearby. With increasing public concern about open-lake disposal, the Army Corps of Engineers, which conducted or contracted for dredging on the United States side of the lakes, determined that it needed to develop an alternative. 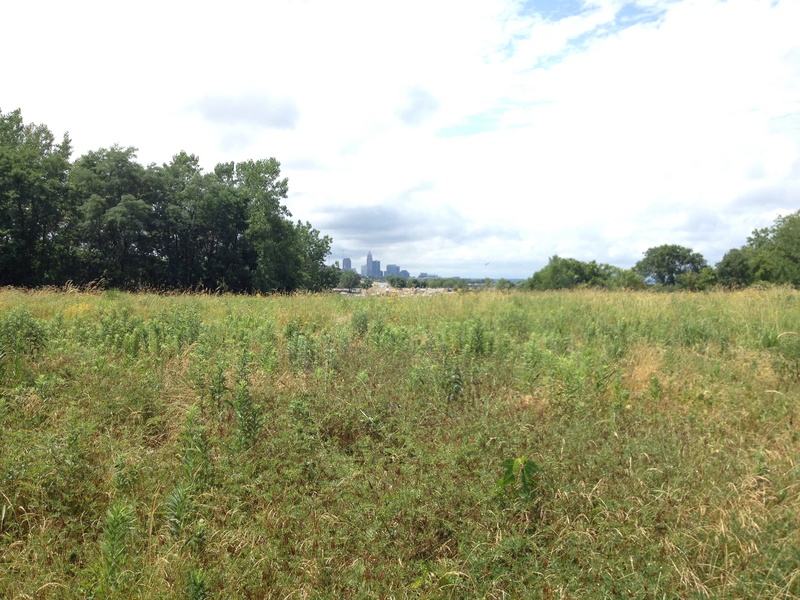 Thus begins the unlikely story of Dike 14 and the Cleveland Lakefront Nature Preserve. Source: U.S. Army Corps of Engineers, Buffalo District, Final Environmental Impact Statement Diked Disposal Facility, Site No. 14 (1975). By the late 1960s, the corps had settled on diked containment areas as the preferred method of disposal, borrowing technology long used to create new land along lakeshores. With the support of Congress and the Environmental Protection Agency, the corps declared that spoils dredged from polluted harbors were to be stored behind corrugated steel and stone walls built into the lakes near harbors. The new method was more expensive, but not prohibitively so. Although containment would allow the corps to stop open-water dumping, the process raised environmental concerns, an indication that in the age of ecology all methods of pollution disposal would come under scrutiny. Regular dredging was an economic necessity in places like Cleveland, an industrial city with a busy harbor at the mouth of the terribly polluted Cuyahoga River, which famously caught fire in 1969. The Army Corps constructed containment areas contiguous to Cleveland’s lakeshore airport, and it stepped up ecological research around dredging and disposal sites. Curiously, the findings in Cleveland—and in many other locations—suggested that the processes were not as damaging as activists feared. Dike 14 quickly evolved into natural habitat for a remarkable variety of species, including migrating waterfowl. It also created 88 acres of new green space less than five miles from Cleveland’s downtown. Despite the lack of compelling scientific evidence, the Army Corps pressed forward with its diked disposal method. In 1975, the corps proposed to build a new containment area, behind what it labeled Dike 14, which extended a project already begun off Gordon Park, where the city had sunk two ore boats and begun filling around them with trash and debris in order to create a recreational peninsula. The proposed diked disposal area would add over 80 acres to this site and solve the ongoing aesthetic and odor problems at that dump. As required by federal law, the corps created an Environmental Impact Statement (EIS) for the project, which said little about the most obvious impact—the elimination of 80 acres from the aquatic ecosystem—but the corps predicted that the rock rubble of the dikes themselves would provide habitat for fishes and other aquatic organisms. The overriding theme of the EIS, however, was the fact that ending dredging was not an option. The spoils had to go somewhere. Public comments revealed continued concern about the diked facility strategy, not just in the specifics of this case, but also generally. One local group, the Joint Committee on Shaker Lakes Park, worried about wildlife impacts, noting that 56 species of waterfowl used that part of the lakeshore as a feeding and stopover area. The corps argued that new lands created by containment areas would actually improve bird habitat, and that waterfowl had already nested in existing disposal sites. The Army Corps created containment areas using techniques developed to make land for other purposes: driving steel into the lakebed and protecting it with stone. Although the process removed habitat from the lake, proponents argued that the rocks would provide new habitat for aquatic species. The Army Corps and the City of Cleveland went forward with Dike 14, beginning construction in 1979. The area received its last dredge spoils in 1999, long after initial estimates thought it would be full. Importantly, even while accepting spoils the containment area evolved into an ecologically valuable site, as it went through a process of natural succession. Native seeds arrived by wind, water, and animals, which also migrated into the site. Just a few years after it had closed, Dike 14 had become a critical migratory bird stopover, covered predominantly by native meadow and forest habitat. Observers for the conservation organization the Audubon Society identified over 200 species of birds on the site. The remarkable ecological transformation convinced the authors of a 2002 study conducted for the state that the land behind Dike 14 should become a protected natural area, abandoning the 1979 vision of a mixed-use recreation park. 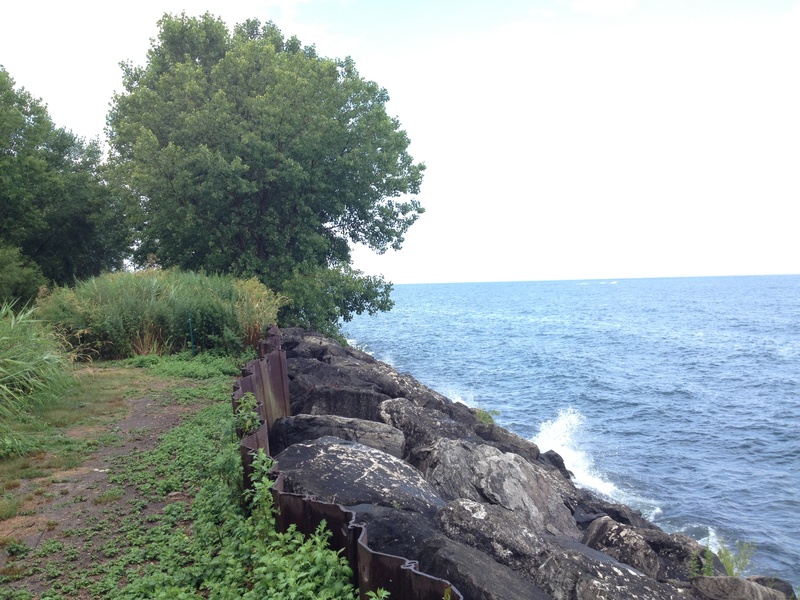 In 2011, the site got a new name: the Cleveland Lakefront Nature Preserve. Open to the public since 2012, it is laced by trails running through willow and maple forests. Deer, turkey, and other native fauna have made their way back into the city to live atop well-contained, polluted spoils. We tend not to tell stories with happy endings in environmental history, but Cleveland’s constructed nature preserve reminds us that there are some to tell. Here, and elsewhere around the Great Lakes, in the 1970s the Army Corps worked to contain a threat. In the process it created an opportunity, one seized by dozens of species—and by Clevelanders longing for a quiet walk along the lake. Stradling, David. 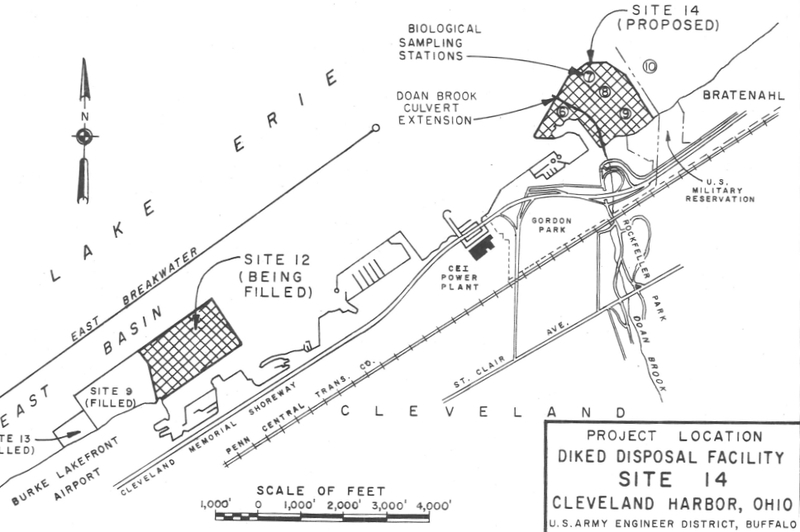 “Dike 14, Cleveland, Ohio: Containing Pollution in the Age of Ecology.” Environment & Society Portal, Arcadia (Summer 2018), no. 15. Rachel Carson Center for Environment and Society. doi.org/10.5282/rcc/8340. Stradling, David, and Richard Stradling. Where the River Burns: Carl Stokes and the Struggle to Save Cleveland. Ithaca: Cornell University Press, 2015. U.S. Army Corps of Engineers, Buffalo District. Draft Environmental Impact Statement: Diked Disposal Facility, Site No. 14. Buffalo, 1975. U.S. Army Corps of Engineers, Buffalo District. Final Environmental Impact Statement: Diked Disposal Facility, Site No. 14. Buffalo, 1975.
International Working Group on the Abatement and Control of Pollution from Dredging Activities. 1975 Report. International Joint Commission (IJC) Digital Archive. Port of Cleveland. "Cleveland Lakefront Nature Reserve. David Stradling has taught urban and environmental history at the University of Cincinnati since 2000. He received his PhD from the University of Wisconsin-Madison in 1996, after having earned a BA and MAT from Colgate University. His most recent book was coauthored with his brother, Richard Stradling. Where the River Burned: Carl Stokes and the Struggle to Save Cleveland narrates the environmental crisis together with the urban crisis, allowing for a fuller accounting of both. He has also published two books on New York: The Nature of New York: An Environmental History of the Empire State and Making Mountains: New York City and the Catskills. His career began with a study of early efforts to control air pollution and resulted in Smokestacks and Progressives: Environmentalists, Engineers and Air Quality in America, 1881–1951. He serves as coeditor of the Urban Life, Landscape, and Policy series at Temple University Press.